Liquid fund is a open ended mutual fund scheme whose investment universe comprises certificates of deposit (CDs), commercial papers (CPs) and government treasury bills (T-bills) with maturities of up to 91 days. ​Maturity is mostly lower than that. The prime objective of these funds is to seek optimal returns while maintaining safety and high liquidity. Liquidity in a day’s notice and no entry & exit loads - Instant liquidity associated with savings bank account lures investors. Liquid funds also offer instant redemption. However, capital market regulator Sebi has put a limit of Rs 50,000 or 90% of folio value, whichever is lower, on such redemptions. Prior to the new regulation, investors had to wait for a day to get their redemption money. For instance, the cut-off time on withdrawal from a liquid fund is generally 2 p.m. on business days. So, if an investor places a redemption request by 2 p.m. on a business day, funds will be credited to his/her bank account normally on the next business day by 10 a.m. Further, most liquid funds have no entry and exit loads which brings additional relief to investors. 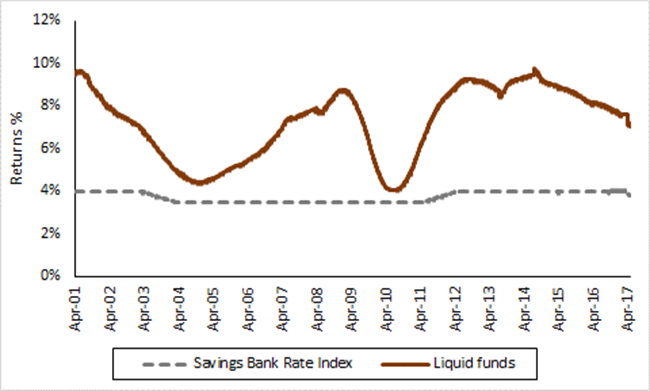 Better yielding – In spite of deregulation of interest rates by the Reserve Bank of India (RBI) in 2011, most banks offer 4% on savings deposits. Though some banks offer higher interest rates, they require higher minimum deposit amount. In comparison, liquid funds offer relatively higher returns. Liquid funds, exemplified by CRISIL – AMFI Liquid Fund Performance Index, returned 7.26% in the one year ended April 30, 2017 (average one-year daily rolling returns). These funds have scored over savi​ngs account in terms of both rolling one-year returns and point-to-point returns.